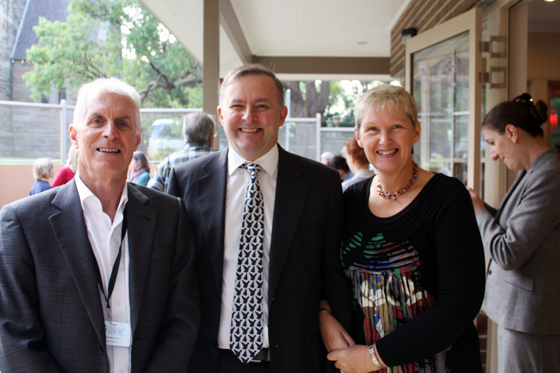 Labor Member for Grayndler Anthony Albanese today attended the opening of the Ella Centre’s Dementia Activity Centre in Haberfield with the NSW Minister for Ageing and Disability Services, Andrew Constance. The centre is the first purpose built facility in Australia for younger people with dementia who are still physically active. It was funded jointly by the Federal and NSW Governments which together contributed almost $1.4 million through the Home and Community Care Program and by the Uniting Church Property Trust which contributed land worth over $700,000. Mr Albanese paid tribute to the Ella Centre’s executive officer Alison Easton and her drive to get this project happening. “Alison raised the idea for this with me a few years ago and we looked in to avenues for delivering funding for the project,” said Mr Albanese. “I am pleased that both the Federal and State Governments came to the party and the centre is now open. Mr Albanese said addressing younger onset dementia was a focus of the Government’s $3.7 billion aged care reforms. ‘We know there are around 16,000 younger people living with dementia and these Australians struggle to navigate a service system they hadn’t previously expected to need for decades.